Okay, So if you follow me on Instagram I’m Sure you saw the series of giveaways I hosted leading up to my 30th Birthday! Being on a new island and far away from my friends and family, it was kinda fun to celebrate with the Instagram community. I wanted to tell you a little more about each shop I worked with and why I am participating with them, and give a virtual hug to each of the ladies behind these shops! If you missed a giveaway or didn’t win the one you wanted, I encourage you to check out each of these small businesses and support them like I do! Meet Jessie, my go to Young Living Consultant, and amazing friend. We met through out husbands and immediately hit it off over cocktails and pinterest! 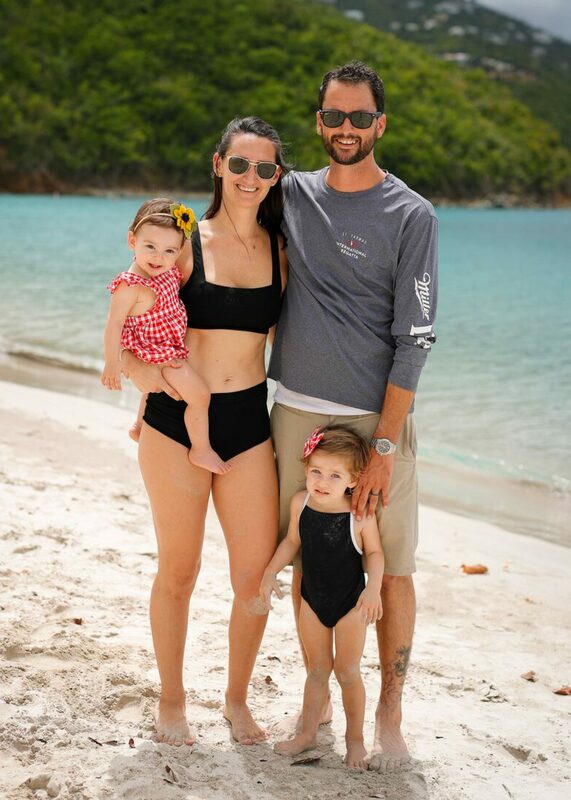 Her and her husband had their honeymoon in St. Thomas, made our wedding memorable and have a son Denver’s age. Jessie and I are constantly chatting about bows, oils and all things baby. Don’t you have that friend that you can tag in endless giveaways? She’s mine. I chose her to participate and Giveaway one of her amazing oil rollers. She introduced me to Young Living and it has been life changing in my family’s life- so I wanted to share. Check our her oil page for uplifting, beautiful content, you won’t regret it! Meet Whitney, the sweetest girl behind this amazing Linen Company. I found Madly Wish through bloggers on Instagram before Ray was born. I’ve gotten a couple pieces from her and they are beyond dreamy. When my family went through the hurricanes in 2017 Whitney reached out to me and sent the girls, warm outfits, special linen pieces and a handmade blanket. It was so sweet and I’ll be forever grateful. I will say too, when you receive something she makes, it smells so amazing, you’ll never want to wash it! I couldn’t imagine a better thing to cover our boppy to make me and the babe feel extra luxurious. Meet Jeleah, the brains behind Eden and Emeralds and the organization guru! Another shop I found on Instagram! Her use of Rifle Paper fabrics, hand written customization and answer to my organization needs drew me in. I have several pouches from her, including wet bags for swimwear and essential oils, and custom bags for all the girls. Each handmade and customized just for me. Every bag in your house needs one of these pouches, this mama does not disappoint! The queen of clips. Our clip jar is filled to the brim with basically every variant she sells! Mary and I have worked together in the past and I am always thrilled to have one of her packages arrive in the mail! Her clips are beautiful and the girls are OBSESSED! I cannot say enough good things about her and her product as you find here, and here. Denver wears these to school everyday, and Ray begs for them to be like her sister. They are so much fun, once you shop you can’t stop! I discovered Raisins Swimwear working on Magens Bay. I was buying from other brands and I had know idea what I was missing. These suits are comfortable, flattering and gorgeous. My collection has only grown, thanks to the amazing women at Raisins. They even have a collection for your littles so you can match, how do I say no to that? I talked more about their suits HERE– follow them on social media and shop their suits, you’ll fall in love! Oh, Miranda. My girl, who has hooked me up with every chalk tag and sign my heart has desired. Her chalkboard tags entered our home last Easter and I cannot get enough. We’ve teamed up for many things like tagging every storage basket in my house, to gracing all our Christmas presents this past year. She’s been incorporated in birthday parties, gender reveals and all the holidays. I love how she customized everything and she is a dream to work with. You NEED these tags in your life, yesterday. If you don’t know yet… the local bakery on St. Thomas has become such an inspiring, fun part of my life. The owner and baker, Alexis has taught me how to decorate a cake in her endless Baking with a Buzz classes, and let me design for her as she expanded her empire into a party shop and cafe. Watching what she creates is beyond amazing, she is a raw talent and so much fun to be around! If we could giveaway a cake and mail it, that’s what we would do. Her treats are out of this world, and I honestly don’t know how to throw a party without her involved. Check out her classes and shop if you are local, if not, stay tuned on her Instagram to droll over her latest creations. Tutus, sweatshirts, jackets, oh MY! I first worked with Carolyn for Denver’s Nutcracker Party- the moment the girls got their hand on her tutu’s- it was instant LOVE. She makes the cutest sweatshirts and things for mama’s and littles, I promise you’ll want to collect everything she makes. Her pieces make the holidays and everyday, extra special! THE place to get your party hats, because everyone needs party hats right? I started shopping with LBO for Denver 1/2 birthday, and the madness never stopped. I pretty much have her make everything custom for me, I was even the one who initiated the ‘One in a Melon’ watermelon hat, which I am very proud of! I absolutely LOVE working with this brand and have the ladies spin on what I’m dreaming up in my head. Literally, the girls celebrations are not complete with out a Little Blue Olive party hat! Give me all the CONFETTI! Adrianne is so talented in how she creates her custom made, hand pressed confetti. I found her through Suga Mama’s Bakery and instantly fell in love. The packaging alone is beyond amazing, not to mention whats inside. I of course have used her confetti at parties but I love challenging myself and doing something creative like decorating eggs, filling snow globes, or framing it with pictures of the girls. She also has beautiful balloons filled with confetti and begging to be made into garlands! RUN to her shop, you’ll be just as obsessed as me! Another shop that I call on for the special occasions. I found them through a little J + K on Instagram, they specialize in custom wood and paper cut items that make amazing signs and the perfect cake and cupcake toppers. I did “big sister” toppers for Denver when Ray was born, I incorporated them into Ray’s first birthday, and they created the name cards to announce baby girl number three was on her way. Their products are SO well done and beautiful! I cannot wait to keep using them in our home and future celebrations! You guys, I LOVE this small shop. Katie is the sweetest shop owner, mama of two and talented creator. If you’ve never heard of FFF you need to know about these felt flowers! The girls have them all, flowers, stars, hearts, basically everything she makes is ADORABLE. And she doesn’t stop at head pieces either, her cake toppers and floral garlands are out of this world and add such a gorgeous touch to anything! I love to use her pieces at all the special occasions, and I’m planning to use them for baby girls arrival too! My love for party supplies runs deep, so when I found Ellie and Piper on Instagram and began working with Tina I was beyond excited. Her shop is curated with all the best things and her eye of putting things together is amazing! I worked with her to do special things for the girls and she went the extra mile to hook my up with AWESOME party supplies for my birthday! If you missed out on the giveaway don’t worry, she is offering 20% off in her shop with the code KLOS– hurry over and get all the cute things! I cannot THANK all of these shops enough for not only making my 30th birthday fun and extra special, but for filling my home with handmade, heartfelt items on a daily basis. The things that come from these shops bring serious joy- trust me! I liked that you were able to think outside of the box to create such a memorable 30th b-day. Thank you! It was so fun! !